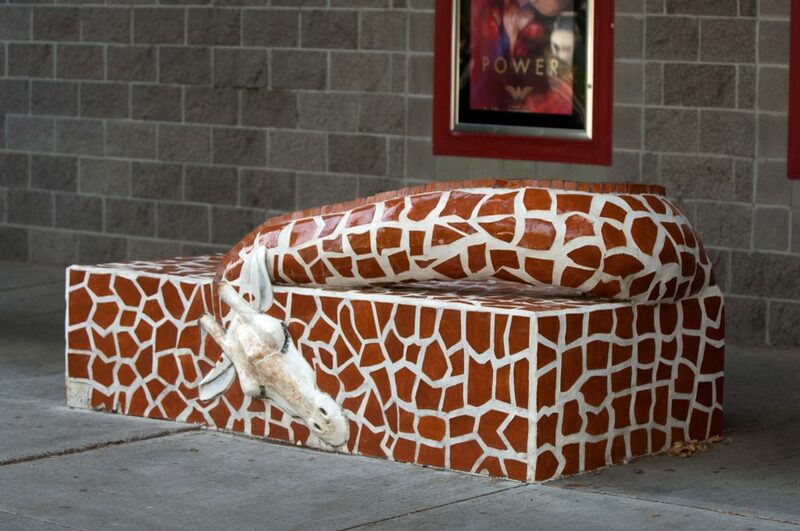 This wonderful bench of a sleeping giraffe, titled “Sleeping Sophie”, by Van Keuren was one of five benches installed in front of the Regal Cinema Complex on F Street in 2014 as an expansion of the Art Garage. Jean Van Keuren decided to continue the theme of the giraffe from her first piece “Sophie” which was installed across the street at the Hallmark Inn on 1st Street. The first sculpture was so popular she decided the whimsical piece would be a great bench for the public area in front of the movie theatre, and indeed, many children have had the pleasure of being able to touch and sit on the sleeping version of Jean’s wonderful creation.